The son of Indian cricket legend Mansoor Ali Khan and acclaimed actress Sharmila Tagore, he grew up in the spotlight. Not only was Khan born into one of India's A-list celebrity families, he is also the 10th nawab of Pataudi, meaning he is technically royalty in the former princely Pataudi state in northern India. Khan, however, chose acting over royal life. 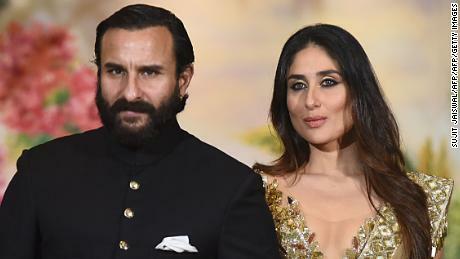 He's been a Bollywood star for more than 25 years, acting in romantic comedies such as "Hum Saath-Saath Hain," the critically acclaimed crime drama "Omkara," and even a Walt Disney Hindi animation.Saif's most recent project "Sacred Games" is the first Netflix original out of India. It has been compared to "Narcos," the platform's hit drama about Colombian cocaine kingpin Pablo Escobar, and is the Indian's star's opportunity to reach an international audience.CNN sat down with the 48-year-old in Mumbai to discuss his career, childhood and being a dad. CNN: Tell me about starring in India's first Netflix original … We have some amazing writers in India who are capable of writing stuff that can be consumed internationally, but the question is: Will it be consumed as much at home? To get the balance right is important and I think the authenticity of the show is amazing. It's the Holy Grail in a way, making something local, and then selling it internationally. The most international thing you can do is export your own values and your own country. "Sacred Games" has given you international exposure. Is that going to be a game-changer?If I really wanted an international career, I would probably be living in LA — not in Bombay … (The Indian film) industry is growing, and we could be architects in our own nation. To be part of a culture at home that's developing carries a very special significance and I'm very content doing that.You've been part of Bollywood now for more than a quarter of a century. What's that been like?It's disconcerting. It's interesting. It's a little exposed. I sometimes don't remember exactly the kind of person I was in the past. I certainly was a naughty kid, and I think I managed to sort myself out. There was a time as a teenager when I was a bit rebellious, unpredictable … (But) it's all worked out quite well, and I feel wiser and I feel a little enlightened and I think it comes from reading or thinking and contemplating stuff. This has led to a certain amount of comfort and understanding, and peace … I don't know how long that will last.You come from royal lineage and inherited the title of nawab of Pataudi from your father. What does this mean?I don't think of myself as a prince. I don't want to be a nawab. I think of myself as a movie actor. Princes in India are no longer recognized by the government, and that's the way it should be. We're a democracy — and I'd much rather be a movie star. Quite honestly, it has similar perks.You have two children, Sarah and Ibrahim, with your first wife, Amrita Singh. Sara is about to make her Bollywood debut. How do you feel about that?Sara is highly academic. She went to Columbia University, in New York, and graduated a year early. I think she could have done anything … When she said she wanted to do films, I would've liked to save her some of the heartache that comes with the unpredictability of the job. (But) it is a profession I love and respect so much, and I'm thrilled she's in it. It has given me absolutely everything … Often, happiness lies in unpredictable places. You're now married to Bollywood superstar Kareena Kapoor, with whom you have a two-year-old son, Taimur. Does the media obsession with your family bother you?Yes, it does, of course it does. But our job is to keep him balanced. I think Indian parents like us, like my parents, have a slightly tough time trying to put good moral values and basic family values into kids who grow up with a bit too much attention. It is possible, and we hope that he's going to grow up fine. We're very conscious about it.What is next in store for Saif Ali Khan? More films, I'm not so sure about TV …I look up to Tom Hardy as an actor and I like the idea of having (another online) show like "Sacred Games." I like to act, it gives me great satisfaction. Much more than ever before. Now, at 48, I'm really enjoying it, so I'd like to continue doing it. That, and hanging out my family and friends, drinking some wine and loafing around parts of Italy or something.